The kennel is located in the small town of Bollebygd, appr. 45 km east of Gothenburg, Sweden. Kennel owner is Mrs. Ulrika Wijk. 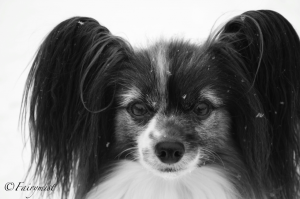 We have a small breeding program of papillon, phalène and manchester terrier in our home. The goal of our breeding program is to breed mentally and physically sound dogs in accordance with the FCI breed standards. In my opinion all three breeds – papillon, phalène and manchester terrier – are active, happy dogs with high intelligence and a lust for working. Our hope is that dogs from Fairymist will be suitable as pets, show dogs just as good as working dogs. However, there are never any guarantee that a puppy will develop into exactly what one is hoping for, and therefore all puppies are foremost sold as pets. We strongly believe that different puppies suit different owners and because of that we do not follow a strict waiting list. The kennel is registered in the Swedish Kennel Club (SKK) since 2010. We are members of the Kennel Club as well as the appropriate breed clubs for all three breeds and follow the rules and recommendations from all these clubs.